A bi-monthly Saturday night event! A unique dinner and movie experience in Victorian Square! 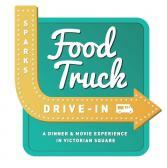 Join us on the 2nd and 4th Saturdays of the month for Sparks' inaugural food truck rally. Eat at your favorite local food trucks, grab a popcorn, and stay for a free movie at the Victorian Square amphitheater. Follow us on Facebook and Twitter (@TruckDriveInNV) for truck lineups & movie/theme announcements!! Blankets and stadium seats allowed. Please leave pets at home. Food trucks subject to change. Taster's Paradise: Mobile Café & Bakery Inc.